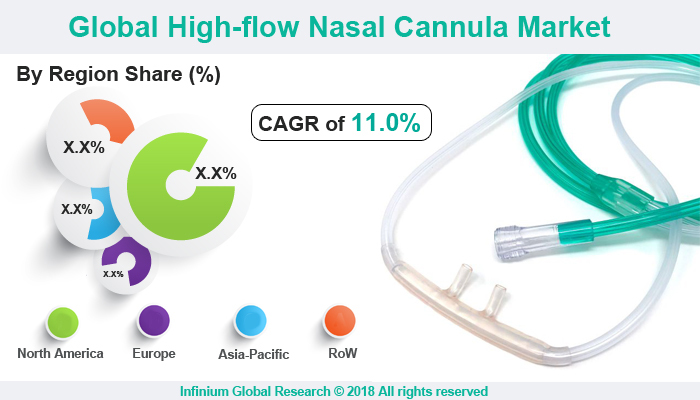 A recent report published by Infinium Global Research on high-flow nasal cannula market provides an in-depth analysis of segments and sub-segments in global as well as regional high-flow nasal cannula market. The study also highlights the impact of drivers, restraints and macro indicators on the global and regional high-flow nasal cannula market over the short term as well as long term. The report is a comprehensive presentation of trends, forecast and dollar values of global high-flow nasal cannula market. According to the report the global high-flow nasal cannula market is projected to grow at a CAGR of 11% over the forecast period of 2018-2024. A nasal cannula (NC) is a device, used to provide extra oxygen to a patient or person in need of respiratory help. Nasal Cannula contains a lightweight tube which then separates into two prongs, these separated prongs are placed in the nostrils of the patients and from which a mixture of air and oxygen flows. One end of the tube is attached to an oxygen supply such as a portable oxygen generator. This cannula is normally attached to the patient by the tube hooking around the patient's ears or by the elastic headband. Nasal cannula supply oxygen in a flexible manner which means the supply of oxygen depends upon the patient’s breathing rate and pattern. The flow rate of oxygen per minute is generally between 1 to 4 liters and are used with nasal cannula The flow rate of oxygen up to 6 liters can be given but this will frequently cause nasal dryness and can be uncomfortable for patients. The benefit of the nasal cannula for the patients who are having chronic stable respiratory problems is that they can eat, talk and drink while using them and also they reduce the risk of carbon dioxide rebreathing. Factors such as increasing occurrences of respiratory disorders such as asthma, chronic obstructive pulmonary disease (COPD), lung cancer, and the increasing popularity of heated humidified high-flow nasal cannulas are driving the growth of high flow nasal cannula market. Furthermore, investments in research and development programs by companies to come up with better products and more sophisticated technologies are also some of the factors boosting the growth of the market. In Addition, the growing acceptance of oxygen therapy for home health care and advancement in developing new techniques is also fuelling the growth of high flow nasal cannula market. In terms of geographic, North America accounts for the maximum market share for high flow nasal cannula market followed by Europe. In North America region factors such as increasing in aged population, increasing patients suffering from respiratory diseases, low prices associated with the use of the nasal cannula and favorable reimbursement policies are driving the growth of the high flow nasal cannula market. Additionally, the high-flow cannula market in the Asia Pacific is anticipated to increase on the favorable demographics, improved health care policies, and the fast-paced economic growth in this region. The report on global high-flow nasal cannula market covers segments such as component, application, and end user. On the basis of the component, the global high-flow nasal cannula market is categorized into an air-oxygen blender, nasal cannula, heated inspiratory circuit, and active humidifier. On the basis of application, the global high-flow nasal cannula market is categorized into bronchiectasis, acute respiratory failure, acute heart failure, chronic obstructive pulmonary disease, and carbon monoxide toxicity by the end user. On the basis of the end user, the global high-flow nasal cannula market is categorized into ambulatory care centers, hospitals, and long-term care centers. The report provides profiles of the companies in the global high-flow nasal cannula market such as Teijin Pharma Limited, Salter Labs, Fisher & Paykel Healthcare Limited, TNI Medical AG, MEK-ICS CO., Ltd., Flexicare Medical Limited, Vapotherm, Teleflex Incorporated, ResMed, Inc. and Hamilton Medical. The report provides deep insights on demand forecasts, market trends, and micro and macro indicators. In addition, this report provides insights into the factors that are driving and restraining the global high-flow nasal cannula market. Moreover, IGR-Growth Matrix analysis given in the report brings insight into the investment areas that existing or new market players can consider. The report provides insights into the market using analytical tools such as Porter's five forces analysis and DRO analysis of high-flow nasal cannula market. Moreover, the study highlights current market trends and provides forecast from 2018-2024. We also have highlighted future trends in the high-flow nasal cannula market that will impact the demand during the forecast period. Moreover, the competitive analysis given in each regional market brings insight into the market share of the leading players. This report will help manufacturers, suppliers, and distributors of the high-flow nasal cannula market to understand the present and future trends in this market and formulate their strategies accordingly.